Uranus' axis is at 97 degrees. which means that it orbits on its side. (Most of the planets spin on an axis nearly perpendicular to the plane of the ecliptic but Uranus' axis is almost parallel to the ecliptic.The three most recently discovered planets were Uranus in 1781, Neptune in 1846, and Pluto in 1930. Jupiter has the shortest day of all the planets. Although it has a circumference of 280,000 miles compared with Earth's 25,000 Jupiter manages to make one turn in 9 hours and 55 minutes. 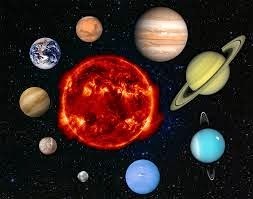 If you are having problems remembering the planets in their correct order, just remember this sentence "My very educated mother justed served us nine pickles," Mercury, Venus, Earth, Mars, Jupiter, Saturn, Uranus, Neptune, Pluto.